Lot 286. Indo-Scythian Kingdom. Azes. Ca. 58-12 B.C. AR drachm. 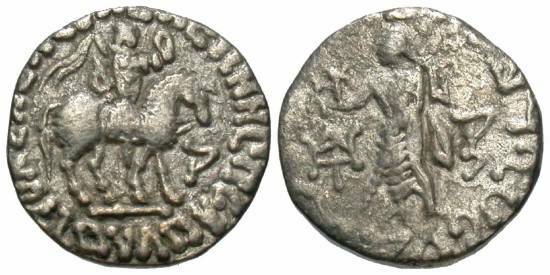 King mounted on horse right, holding whip, with Kharoshthi letter at right and Greek legend around / Zeus standing left, holding Nike in outstretched right hand, sceptre in left, with monogram to left and Kharoshthi legend around Maharajasa rajarajasa mahatasa/ Ayasa (of Great King, King of Kings Azes the Great). Senior 105.310D; MIG 857h. Lightly toned. Very fine.